Greenhouse gases in the Earth’s atmosphere reached another grim milestone earlier this year as carbon dioxide levels surpassed the symbolic threshold of 400 parts per million across much of the planet, the premier global meteorological association confirmed in a report to be released Monday. Figures compiled by the World Meteorological Organization showed strong growth — and new records — in the concentrations of all three of the most important heat-trapping gases, continuing a long-term trend with ominous implications for climate change, the group said. The report is likely to add to concerns about global warming in a year that climate experts say is almost certain to surpass 2014 as the hottest year in recorded history. “We are moving into unchartered territory at a frightening speed,” WMO Secretary General Michel Jarraud said of the report’s findings. The WMO maintains the world’s biggest network of sensors detecting changes in the makeup of the Earth’s atmosphere. For decades it has tracked rising concentrations of greenhouse gases such as carbon dioxide, a naturally occurring chemical compound that is vital for plant life and also acts as an insulating blanket, trapping the sun’s heat and making the planet warmer than it would otherwise be. 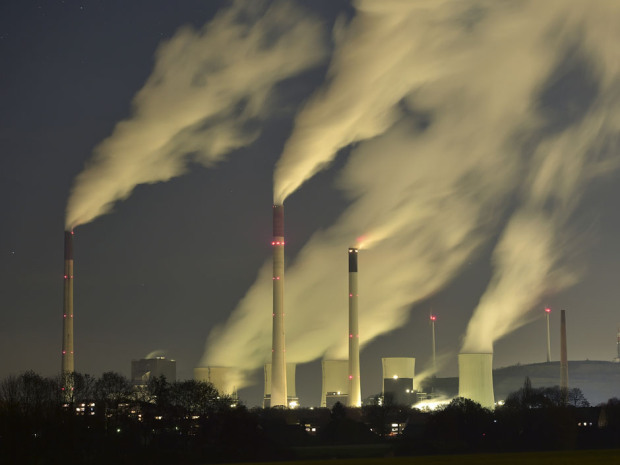 With the burning of fossil fuels, levels of atmospheric carbon dioxide have risen steadily, soaring from about 278 ppm during pre-industrial times to above 390 ppm by the start of the current decade. Many scientists contend that the carbon dioxide levels should remain well below 400 ppm to avoid long-term disruptions to the Earth’s climate. But since 2012, several of the WMO’s 125 individual monitoring stations have detected readings above that threshold. The global average climbed to 397.7 ppm in 2014, the WMO report said, and then, in early 2015, it exceeded 400 ppm for the first time since record-keeping began, the organization’s data shows. The level then dipped, as usual, with the arrival of spring growing season in the Northern Hemisphere, when trees and other plants take carbon dioxide out of the atmosphere. But WMO officials say the planetary average is expected to remain above 400 parts per million beginning in 2016. “We will soon be living with globally averaged CO2 levels above 400 parts per million as a permanent reality,” Jarraud said. The long-term implications for the planet, he said, include “hotter global temperatures and more extreme weather events” as well as melting ice, rising sea levels and increased acidity in oceans. “It is an invisible threat, but a very real one,” he said. The WMO report, an annual compilation of monitoring data from the organization’s Global Atmospheric Watch program, shows carbon dioxide concentrations rising by 0.5 percent from 2013 to 2014, roughly on par with the average annual increase over the past decade. But two other key greenhouse gases — methane and nitrous oxide — appear to be increasing at a fast rate, the report said. Methane increased by 9 parts per billion from 2013 to 2014, compared with an average annual increase of 4.7 ppb, the report said. The combined radiative “forcing” from all these gases – essentially the warming effect on the planet – has now risen by 36 percent since 1990, the report said. It said consequences will continue to be felt for centuries, since new emissions of carbon dioxide will remain in the atmosphere for centuries. The release of the report comes three weeks before the start of international negotiations in Paris on a proposed treaty to reduce global emissions of greenhouse gases. Diplomats from more than 190 countries are expected to participate in the talks, which are intended to put the planet on a path toward capping and then reducing carbon pollution. The Obama administration has pledged to reduce U.S. emissions by up to 28 percent by the year 2030, compared with the baseline year of 2005. Posted on November 9, 2015, in Apocalypse Now and tagged climate change, global warming, greenhouse gas, World Meteorological Organization. Bookmark the permalink. 1 Comment.